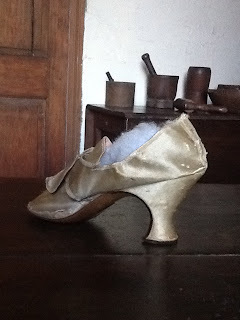 London court shoes have in common? Both are labeled and use a brand identity to associate the user with their product, whether it be from the 18th century or the 20th. 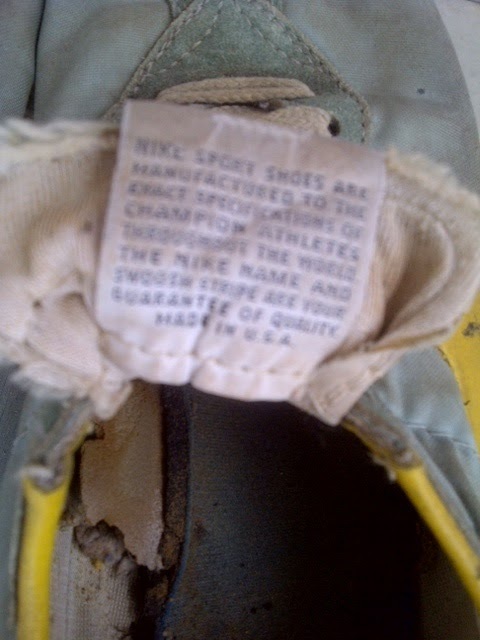 The Nike Tailwinds feature the registered patent number on the sole and on the inside of the tongue, proudly announce that "the Nike name and Swoosh stripe are your guarantee of quality. 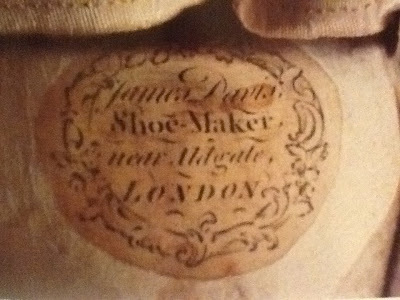 Made in U.S.A." In a similar manner, James Davis has affixed a specially designed label to his shoes, stating his occupation as shoemaker and his location, "near Aldgate, London." Both are incredibly well worn - albeit for different purposes - but with similar results. 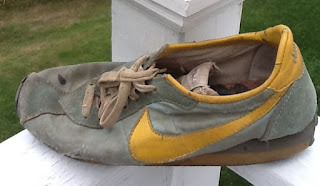 My Nikes have little left of the tread, they are knotted, stained, torn and frayed. Mehitable's court shoes are also well-worn, torn, faded and frayed. 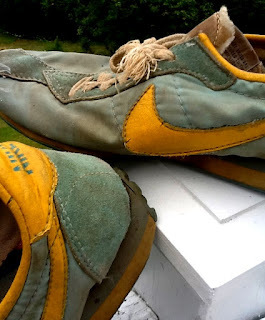 A look at them from above or from the back makes this clear - just as the Nikes interior foam is now crumbling, so too the silk of the London shoe is shattered. 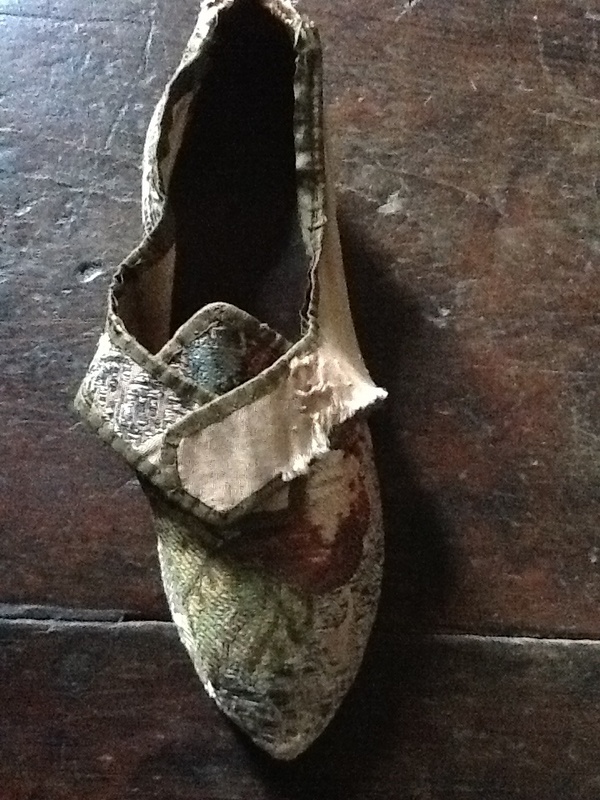 Finally, and perhaps most importantly, the shoes - in both instances- made the wearer feel empowered. 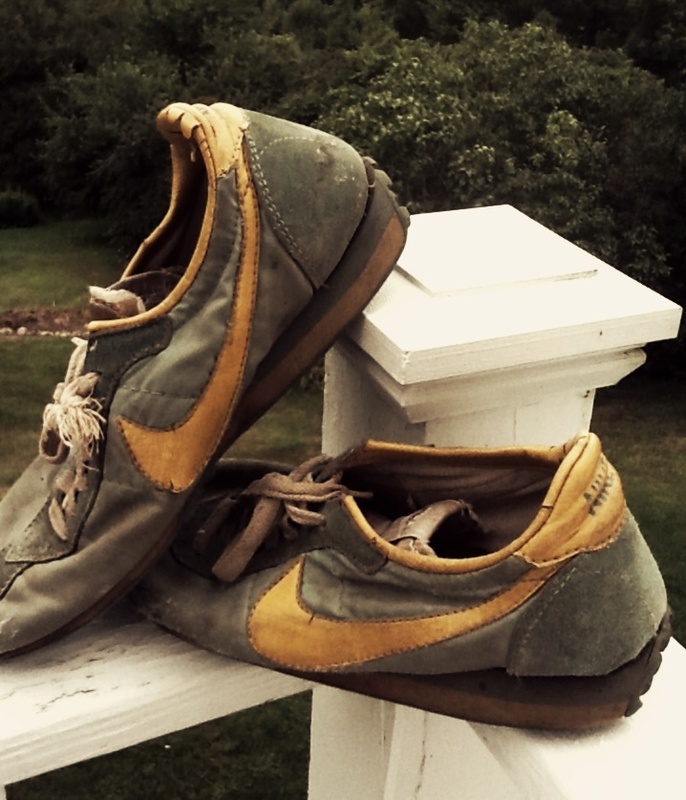 For me, my Nikes started a cross country running adventure. I had just started as a junior at a new school and could not run the length of a football field; by the end of November I was running 5-8 miles a day. While one can never know for sure how Mehitable Rindge Rogers felt clad in her silk London shoes with three inch heels, but one can speculate that she felt some measure of success and composure. While wearing her shoes, she was in control of her domain, at least for some span of time. And isn't that why, at the core, we love some of our shoes, selecting certain ones while eschewing others? All images of Mehitable Rindge Rogers shoes are reproduced courtesy The Warner House Museum, Portsmouth, NH. See SilkDamask archive for previous posts on labeled Georgian shoes and contemporary shoes designed by Emma Hope, London. Generally, our impulse is to gravitate toward the best and finest examples of a type. 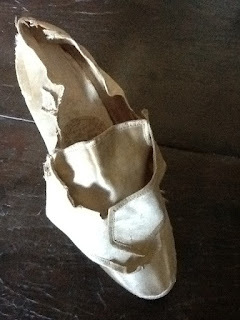 Today's offering is a glimpse of footwear which, rather than representing the epitome - those in top condition, in excellent repair and with established provenance --reveal what is probably a more accurate historical reality: women held onto their shoes for years, updating them for the current fashion, repairing and modifying them to accommodate comfort, aging or even letting them out after feet expanded from many years of childbirth. 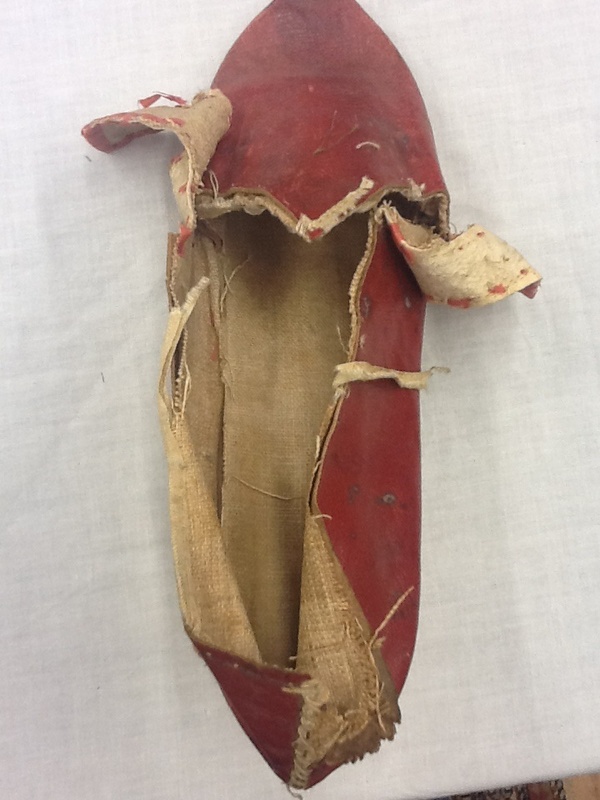 Few of the original owners of the shoes included here are known and the institutions who have retained them are to be commended for providing a different look at how women wore and modified their shoes. 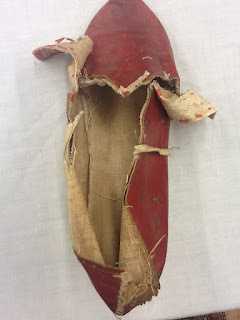 The more opportunities I have had to investigate shoes, the clearer it has become that approximately 8 out of 10 pairs have been altered in some way. 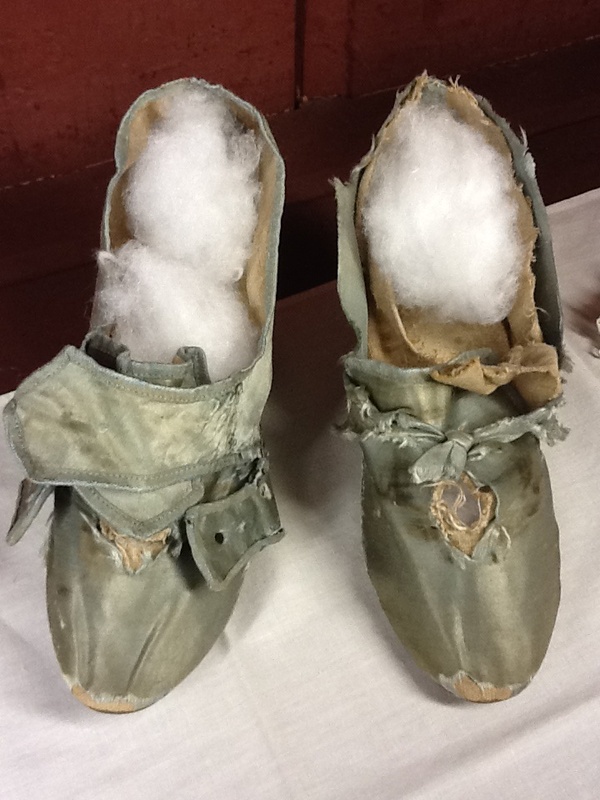 Generally, these are not the shoes you will see in exhibitions and publications, but these shoes hold an equally fascinating history to their prim and tidy counterparts. This makes for a richer study of craftsmanship, technology, fashion and society. Well worn, tattered and torn. Torn braid, worn down heels. 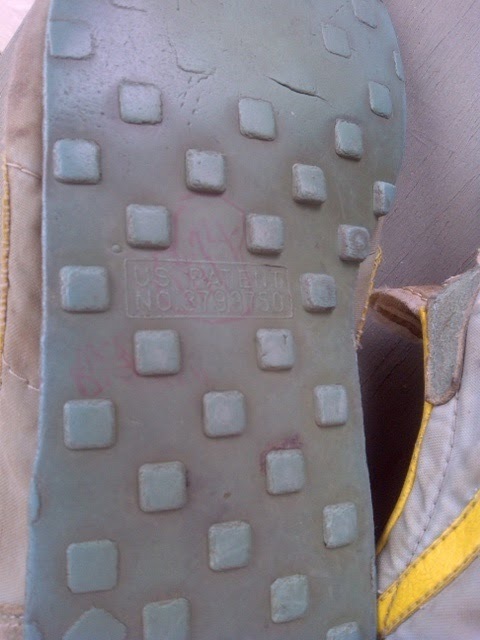 Ill cut insoles and sloppy stitching. Downgraded and updated. 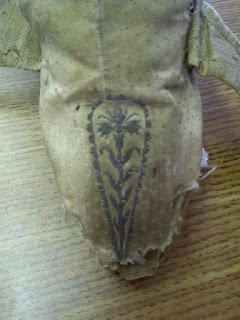 Buckles missing and sheen-less silk. Shoes were a highly valued, costly possession and for most in Colonial America and the young Republic, they represented economic or social success. They were maintained and altered and updated as long as the leather was still good. Have you looked at your shoes lately? 5. The Warner House, Portsmouth, NH., Mehitable Rindge Rogers, made by James Davis, London, c. 1760s, detail, heel. 6. The Warner House, Portsmouth, NH. Hermione de Paula's work stirs the imagination. 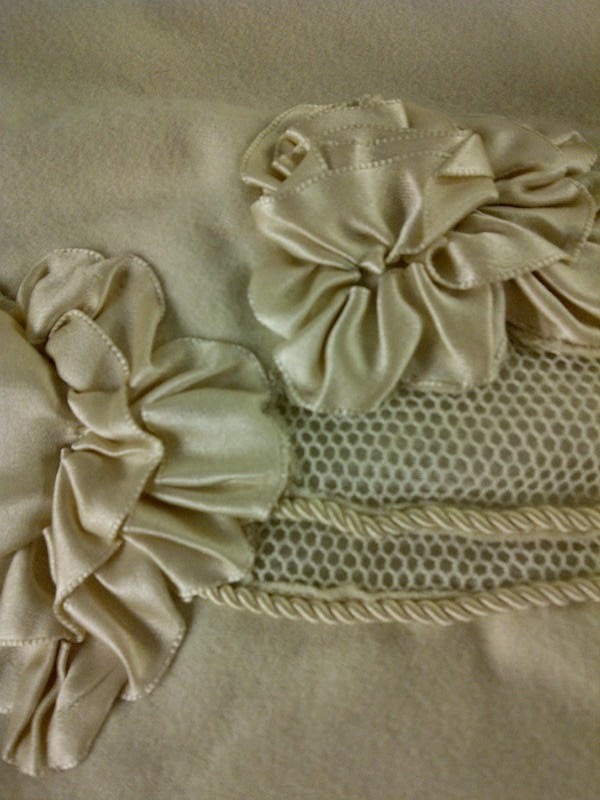 Among those who have followed historic textiles and garments for some time, it is frequently designers who develop new and exciting contemporary style based on an understanding of the nuance (rather than the creation of a pastiche, or direct copy) and the underlying aesthetic philosophy of past eras, which intrigue us. 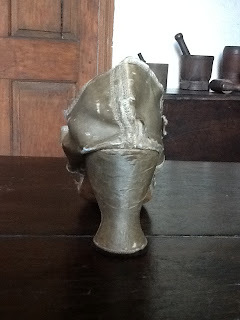 Such was the case when I first happened on the work of Hermione de Paula at Liberty of London in 2011. Her striking signature, handpainted prints, design and styling exhibit a core understanding of the exotic interest in flora and fauna of the late 19th century. While she pays indirect homage to 19th century Liberty prints made famous by William Morris and members of the Arts & Crafts movement, Ms. de Paula also understands the "total design" aspect of the the art nouveau and art deco periods, where on the surface, prints and patterns and colors may seem at odds but, when combined, create a breathtaking composition, from head to toe. A visit to her website, and the opportunity to download her current season look books, will transport you and you will not be disappointed. Born from London’s prestigious Central St. Martins,Hermione de Paula began her career working for luxury labels including, Christian Dior Couture, Alexander McQueen and John Galliano. Renowned for her stunning, hand drawn, floral prints, she channels her signature ‘twisted English rose’ aesthetic across her collection of delicate silk dresses and chiffon kaftans. SB: How would you describe your personal style? HDeP:My style is fairly eclectic with lots of layers. I'm really into shirts and capes at the moment. I wear a lot of my own pieces and mix them with vintage. I have lots of art deco jewellery collected from my travels and pieces which have been passed down by my grandmother who had an incredible wardrobe. High heels are obligatory. SB: Where do you look for inspiration if you don't know what to wear? HDeP: I love old movies - beautiful actresses in Hollywood from the 1920s to the 1950s. 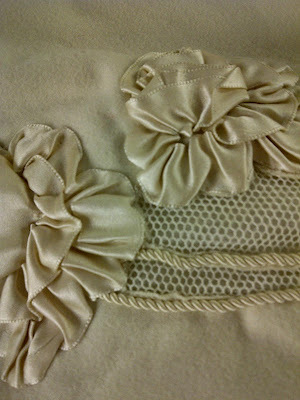 I like to dress-up to change my mood so on a rainy day I’ll get a sequin gown or beaded cape out to brighten the mood. 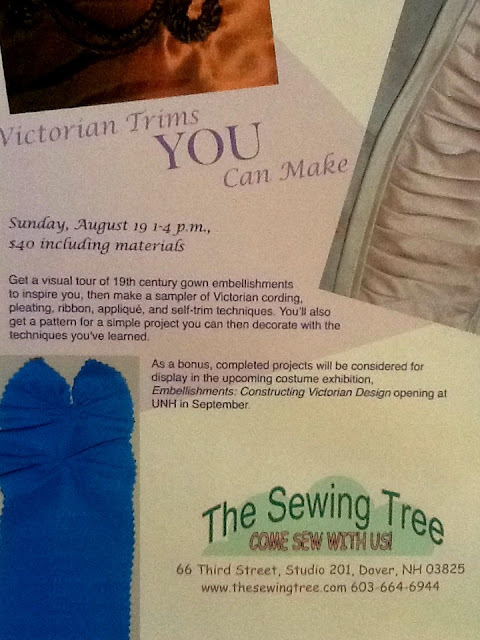 Join Astrida Schaeffer, costume historian and mannequin maker at the Sewing Tree for this educational and creative event.